Somewhere between an omelette and a frittata, this omelettata is a tasty middle-ground, chock full of yummy veggies! Here is one of my absolute favorite meals that I go to when I haven’t really planned anything big for a meal. It’s an omelette. No, it’s a frittata. What’s the difference between them anyway? Wikipedia says an omelette is ‘a dish made from beaten eggs quickly fried with butter or oil in a frying pan’. 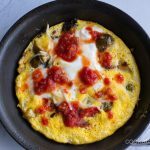 A frittata is ‘an egg-based Italian dish similar to an omelette or crustless quiche, enriched with additional ingredients such as meats, cheeses, vegetables or pasta.’ So this recipe is kind of in between both of them. I love my omelette (recipe here), but I also love putting in lots and lots of veggies. And my poor little eggs just weren’t able to cover all that I wanted to put into it. So I thought to myself, what if I just cook the eggs around whatever is going with them? I think you are meant to broil or grill the top of a frittata, or put it in the oven, to make it a true one, but I can’t wait for that. So I heat up my veggies, quite frequently using this recipe , combine the eggs and then pour them over the veggies. 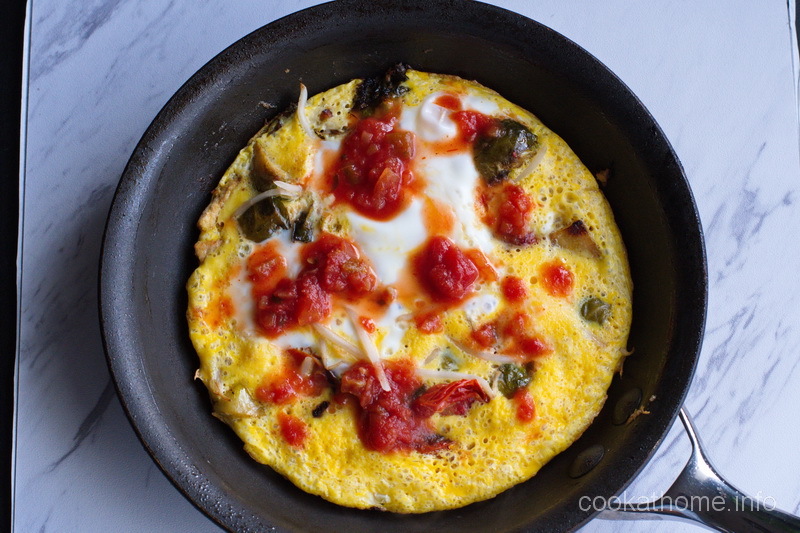 Put a lid on the frying pan until the eggs are cooked through, then add salsa and tahini. Is that strange? Well, if it is strange, then call me strange, because I’m not going to stop making and eating this omelettata! And I hope you try it out too! Heat oil of choice in a medium sized frying pan. Add the vegetables and heat them through. Spread them evenly around the frying pan. Whisk the eggs together to thoroughly combine the yolks and whites. Pour into frying pan and put a lid on top. Remove lid when eggs are cooked through and serve with additional desired toppings. - Roast a combination of root and other vegetables such as Brussels sprouts, bell peppers, etc. - Sun-dried tomato and spinach with bacon or other meat for a higher protein content.